The automotive helmet is designed by Luusama. The 610 helmet line is one of the coolest lines on the market. mask to allow for easy air ventilation. Interiors are lined with high quality red calfskin napa leather. unique helmet bell art to ensure you ride with style. can set out on the road in safety and with pride. 1.Find a flexible measuring tape or string. mid-forehead, and ⅛ in. above the ears. 4.Use the size chart to determine the correct helmet size for you. 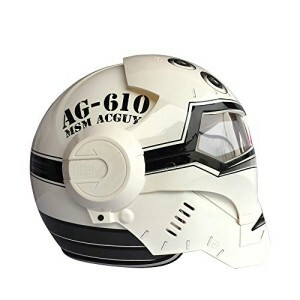 -The mobile helmet is design by famed helmet designer Luusama with removable flip up front mask and body kits. -Dot motorcycle helmet comes with high quality ABS shells and strong protection foams. -Double ring buckles and strong straps provide strong protection against head impact. -The graphic lightweight motorcycle helmet is made out of removable and washable liner and pads. -Great for the open road, city riding, and mountain bike riding as well as a gift to a friend.